When Benjamin Henry Latrobe (1764–1820) arrived in cosmopolitan Philadelphia in 1798, the city had been the capital of the “new Republic” of the United States for eight years. By introducing Philadelphians to Grecian-influenced architecture with his Bank of Pennsylvania, completed in 1801, he ushered in a new style, already transcendent in Europe, that would come to dominate American design in the first half of the nineteenth century. Latrobe was to help make Philadelphia what, in 1811, he predicted it would become; “the Athens of the Western world.”1 Latrobe, a London-trained architect, was finely attuned to the broad interest in ancient cultures that had swept Europe in the second half of the eighteenth century. He understood the connection, already fostered in America by Thomas Jefferson, between the rich architectural heritage of the Greek and Roman democracies and their natural successor flourishing on the banks of the Delaware. Latrobe found in Philadelphia a sophisticated society familiar with the evolutions in taste in France and England. Government officials steeped in French culture after years of service in France, as well as a large French community, helped establish a market for the most fashionable goods. Indeed, Philadelphia was the most popular American destination for French and San Domingan French émigrés after the French Revolution of 1789 and the Haitian Revolution of 1793. In 1797 it was estimated that there were 25,000 French in the United States, with almost a third in Philadelphia. Among them was the future king of France, the duc d’Orleans, who arrived in 1796, followed shortly by his brothers, the duc de Montpensier and the duc de Beaujolais. Thomas Jefferson, the American apostle of classicism, arrived in Philadelphia in 1790 with no less than eighty-six cases of neoclassical furnishings from Paris. James Madison was also there and apparently ordered French furnishings from James Monroe while Monroe was in Paris from 1794 through 1796. Madison later acquired more pieces in 1803 when he purchased some of Monroe’s French furniture from his house in Philadelphia. Even President George Washington brought with him to Philadelphia a group of neoclassical furnishings he acquired in New York from the Marquis de Moustier, the first French minister to the United States. In 1815 Joseph Bonaparte arrived, and was perhaps the most important influence of the era in disseminating European tastes and fashion. Philadelphia was also home to a well-read and well-traveled elite group of wealthy local citizens, among them Robert Morris, William and Anne Bingham, and their neighbors George and Sophia Harrison, Edward Shippen Burd, Stephen Girard, Joshua Gilpin, John Markoe, and William Waln, whose wealth, education, and taste could be discerned from their fashionable acquisitions. Philadelphia continued to be a repository of Classical taste and fashion, inspired by Latrobe’s private commissions and public monuments. His mantle was picked up by younger architects like William Strickland, who produced, in 1818, designs for the Second Bank of the United States, the first important Greek temple building in America; and Thomas U. Walter (1804–1887), whose masterwork, Founder’s Hall of Girard College in Philadelphia, is considered one of the finest examples of Greek Revival architecture in the country. This combination of monied and educated patrons convinced of the appropriateness of classical design, and a desire to be in step with international style, together with a community of designers and craftsmen, many of European origin, made Philadelphia a fertile ground for the introduction of archeological classicism: furniture modeled on ancient furniture forms, rich in symbolism, and inextricably associated with philosophical notions about Republican government. The result was the creation of much of the finest classical furniture produced in America in the first forty years of the nineteenth century. Paint decorated Klismos side chair, designed by Benjamin Henry Latrobe (1764–1820), made by Thomas Wetherill 3 (d. 1824), and possibly painted by George Bridport (1783–1819), Philadelphia, circa 1808. Oak, yellow poplar, white pine, plaster composition, paint and gilding. H. 34©, 19˙, D. 22 in. Courtesy of the Philadelphia Museum of Art; gift of Marie Josephine Rozet and Rebecca Mandeville Rozet Hunt, 1935. There is no purer or more evocative furniture form in the lexicon of neo-classical furniture design than the Greek Klismos chair. Klismos chairs were found painted on Greek vases unearthed in southern Italy throughout the eighteenth century, and seen in wall paintings excavated at Herculaneum and Pompeii.4 As the quintessential expression of Greek furniture design, interpretations were published by every important furniture designer of the first half of the nineteenth century. 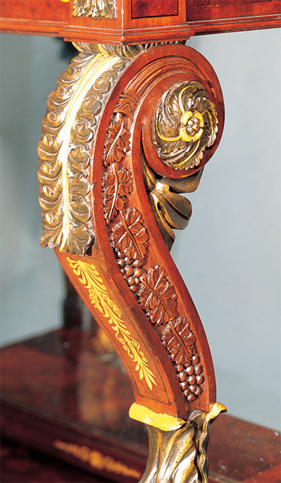 With its curving tablet crest rail extending beyond the rear stiles and front and rear saber legs, it represented not just a radical departure from rococo furniture popular only twenty years earlier, but a complete departure from the neoclassicism of Adam and Hepplewhite, and designs from Sheraton’s Drawing Book, known here as Federal furniture. 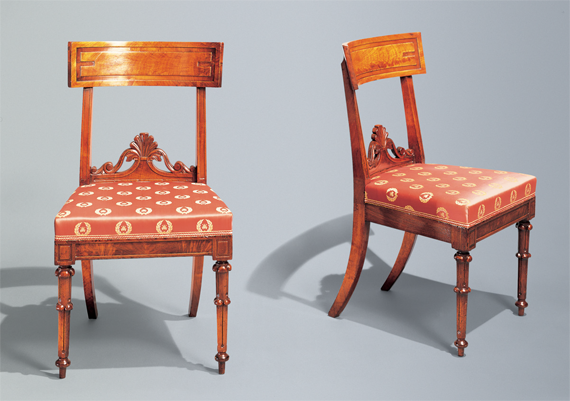 The Klismos chairs designed by Latrobe in 1808 for William Waln, of which fifteen have survived (one is illustrated here) are among the earliest documented Klismos style chairs made in the United States. It is most likely that Latrobe was inspired in his design from Thomas Hope’s Household Furniture and Interior Decoration (London, 1807), the influential classically-inspired pattern book of the English Regency. The early date of these chairs reminds us that the United States was no longer a colonial backwater but fully in-step with Western fashion. The Waln suite of furniture is as high-style and avant-garde as anything produced in London or Paris at the same date. Mahogany Klismos chairs by Richard Parkin, Philadelphia, circa 1835. Two from a set of eight. H. 33, W. 18 in. Private Collection. Photography courtesy of Carswell Rush Berlin, Inc., New York. The Klismos form was to dominate chair design for forty years and, while several regionally distinctive designs emerged from Philadelphia, an 1835 example by Richard Parkin attests to the power of the style and the taste of the society for which they were made. Identical chairs to this set, in the Landis Valley Farm Museum in Lancaster, Pennsylvania, bear the paper label of Richard Parkin while at his Egyptian Hall address. 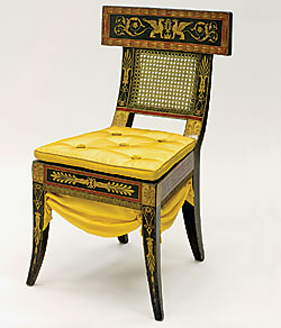 The design is inspired by chairs made by Georges Jacob published in 1805 in Pierre de la Mésangère’s Collection de Muebles et Objets de Gout (Paris 1802–1835). Unlike Jacob’s design, the front legs of these chairs anticipate the Gothic Revival. An additional source of inspiration may have been plates 15–17 of Thomas King’s The Modern Style of Cabinet Work Exemplified (London, 1829). Combining French and English sources is a salient characteristic of American Classical furniture. Carved, gilt, and verde-antique paint decorated marble top center table, by Thomas Cook and Richard Parkin, Philadelphia, circa 1825. H. 29, Diam. 38 in. Bearing the stenciled mark: COOK & PARKIN/ Cabinetware/ Mahogany [?] seating/ No. 36 Walnut St./ Philadelphia. Private Collection. Photography courtesy of Carswell Rush Berlin, Inc., New York. Center table, attributed to Anthony Gabriel Quervelle (born Paris, 1789, died in Philadelphia 1856), Philadelphia, circa 1825–1830. Mahogany primary with ash, mahogany, and chestnut secondary woods; verde antique paint; die-stamped brass inlay; gilt brass mounts; marble; brass and steel castors. H. 29, Diam. 54 in. Courtesy of Hirschl & Adler Galleries, New York. 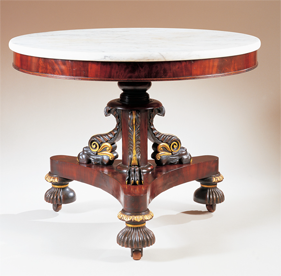 This magnificent center table attributed to Anthony Quervelle (1789–1856), illustrates both the wide variation of style within the context of a particular form and the high level of sophistication demanded by and available to Philadelphia patrons. This table, referred to in the period variously as a pillar and claw table or circular library table boasts superb carving treated in verde antique (painted to resemble weathered bronze like those objects excavated at Herculaneum), lacquered brass mounts, a marble inset, and spectacular radial inlaid top (which connects the piece to a drawing in Quervelle’s sketch book recently acquired by the Philadelphia Museum of Art), with an extraordinary diecut brass foliate inlay cross banding. This style of inlay is associated in the nineteenth century with the English master cabinetmaker George Bullock and, in America, rarely found outside of Philadelphia. Carved, Gilt Stenciled and Bronze-Powder Paint Decorated Mahogany Pier Table, Attributed to Anthony G. Quervelle, Philadelphia, circa 1825–1830. H. 38˙ W. 47˙, D. 22 in. Private collection. Photography courtesy of Carswell Rush Berlin, Inc., New York. Emigrating from France in 1817, Anthony Quervelle’s influence on Philadelphia furniture seems to have been so pervasive that his style has become synonymous with Philadelphia classical furniture, much like Duncan Phyfe’s has with New York furniture from the same period. 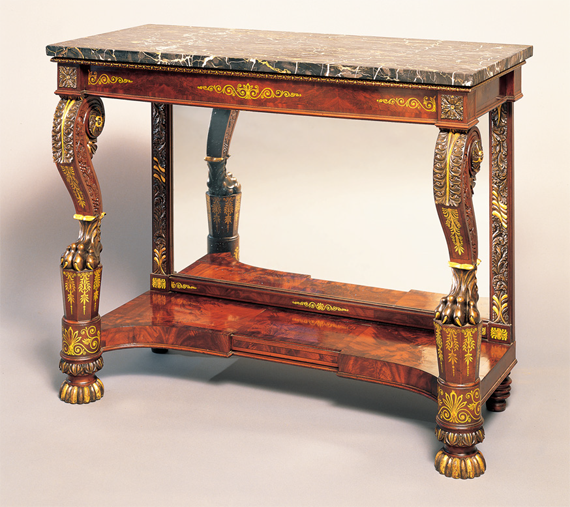 Characteristic of Quervelle’s work is fine grape vine carving, gadrooning and a sophisticated combination of stencil and bronze-powder paint decoration as exhibited in this masterpiece pier table, similar to those he made for the White House in the Jackson administration.7 The scrolled legs terminating in animal paw feet reference Greek and Roman furniture such as tripod stands and candelabra bases seen in Piranesi’s work and in archeological architectural drawing published in London by Charles Heathcote Tatham in 1799. This scrolled leg defined the style of the French Restauration, popular in America between 1830 and 1840. Secrétaire à abattant, attributed to Joseph B.
Barry (1759/60–1838; active 1794–1833), Philadelphia, circa 1820. Rosewood, partially ebonized; cedar, mahogany, pine, and poplar secondary woods; die-stamped brass inlay inset with ebony; brass locks and hinges; leather writing surface, partially tooled in gold. H. 65˙, W. 42ƒ, D. 42˙ in with fall front open. Signed and inscribed (with incised stamp, on brass lock on fall front): [crown]/J. BRAMAH/[crown]/ PATENT. Courtesy of Hirschl & Adler Galleries, New York. 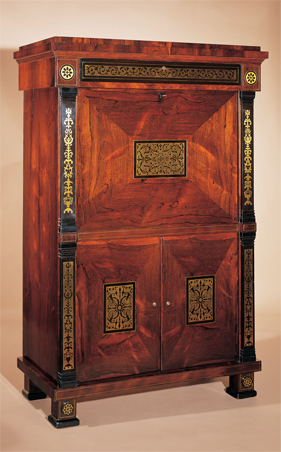 Barry is thought to have made the most important group of Boulle work American furniture. He is linked to these pieces by a single newspaper advertisement in Philadelphia’s American Daily Advertiser of September 11, 1824, in which he offered for sale “2 Rich Sideboards, Buhl [sic] work and richly carved.” Newly discovered documentary evidence, including bills of sale and bills of lading for other Boulle-work pieces, seems to solidify the Barry attribution. Born in Dublin, and trained there and in London, Barry immigrated to Philadelphia and is first listed in the city directory in 1794 in partnership with Alexander Calder. Barry is listed alone by 1797, and remained in the directories until 1833. Classical carved mahogany sofa, possibly Anthony G. Quervelle (1789–1856; active 1817–1856), Philadelphia, circa 1825–1830. Mahogany; mahogany, pine, and tulip poplar secondary woods; caned seat with upholstered slip seat; gilt-brass castors. H. 35˚, L. 96©, D. 23μ in. Courtesy of Hirschl & Adler Galleries, New York. Another evocation of ancient Greece and Rome was the scroll-arm sofa inspired by the fulcrum-ended beds used then for reclining while dining. This monumental Philadelphia example exhibits characteristic acanthus leaf carving and a shell design now associated with Quervelle through the recent discovery of his sketchbook in the collection of the Philadelphia Museum. The seat rail conjures Greek architecture with the rosettes and metopes of a Doric frieze terminating with palmette acroteria. The crest rail and animal feet are part of the ubiquitous classical vocabulary that might have been gleaned from Piranesi. The sofa’s design may have been influenced by a settee illustrated in Thomas Hope’s Household Furniture (London, 1807), plate XVIII, No.5. Classical carved mahogany sofa table with “plumb-pudding” mahogany top, Philadelphia, circa 1825. H. 28, W. 59© (leaves open), D. 30˙ in. Courtesy of Carswell Rush Berlin, Inc., New York. The beautiful countersunk foliate carving characteristic of Philadelphia, closely related to the carving on the previously illustrated sofa, can be seen in the down-swept legs and lyre base of this rich “plumb-pudding”-top sofa table. The double stretcher is also a typical device of Philadelphia table construction. 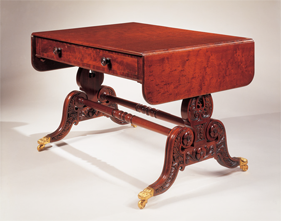 The sofa table form, introduced by Thomas Sheraton in his 1803 Cabinet Dictionary, is extremely rare in American furniture. The profile of the scrolled legs were options in plate 5 of the Philadelphia Cabinet and Chair Maker’s Union Book of Prices for Manufacturing Cabinet Ware (Philadelphia, 1828). Thomas Sheraton, The Cabinet Dictionary (London, 1803), “Gentleman’s Secretary,” plate 68. Thomas Sheraton, The Cabinet-Maker and Upholsterer’s Drawing-Book, Appendix (London, 1802), “A Sideboard with Vase Knife Cases” plate 21. This image illustrates how elements from seemingly unrelated objects were used by craftsmen in the period. Here, Fligler (Flagler) selected the pedestal ends with their cavetto molded tops; the arched central section; and the leaf carving in the spandrels. 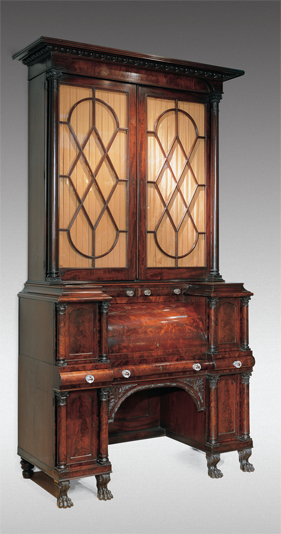 Carved mahogany cylinder secretary bookcase, probably by Henry Fligler/Flagler (active 1816–1825), Philadelphia, circa 1825. H. 101˙, W. 53, D. 24˙ in. Courtesy of Carswell Rush Berlin, Inc., New York. While many forms of early-nineteenth-century furniture sprung directly from Greek or Roman prototypes made of stone or bronze, many other forms created for modern use in the nineteenth century had no ancient precedent and relied, therefore, on classical architectural motifs and iconography to express the classical taste. In combination with zoomorphic and anthropomorphic elements, forms such as card tables, armoires, work tables, bureaus, and secretaries could assume an archeological flavor. In this stunning cylinder secretary bookcase the egg-and-tongue molding under the flat cornice is correctly used with the Ionic order in the upper section, and a composite capital, shown in plate 31 of Thomas Sheraton’s Cabinet Dictionary, is used in the lower case flanking all the cabinet doors. This and the carved animal paw feet establishes the classical credentials of the piece, which is otherwise drawn, in most of its details, from Sheraton’s Drawing Book and Dictionary (see illustration). It is reflective of the power of Sheraton’s work that his designs were still being incorporated into classical furniture thirty years after their publication. The author thanks Elizabeth Feld and Stuart P. Feld of Hischl & Adler Galleries for providing photography and related information on pieces from the firm’s select inventory. Carswell Rush Berlin is a New York-based private dealer in American formal classical furniture and an adjunct professor at NYU. His articles and furniture have been featured in several publications and he is writing a book on American classical furniture. 1 Benjamin Henry Latrobe, “Anniversary Oration to the Society of Artists,” in John C. Van Horne, ed., The Correspondence and Miscellaneous Papers of Benjamin Henry Latrobe, vol. 3, 1811–1820 (Yale University Press, 1988). 2 Phillip M. Johnston, A Checklist of Books Relating to Architecture and Decorative Arts Available in Philadelphia in the Three Decades Following 1780, Master’s thesis, University of Delaware, 1974. 3 There is continued discussion as to Wetherill’s attribution. 4 P.F. Hugues [P.-F.-H. d’Hancarville], The Collection of Etruscan, Greek and Roman Antiquities, from the Cabinet of the Honble. Wm. Hamilton, 4 vols. (Naples, 1766–76) and Accademia Ercolanese, Le antichità di Ercolano esposte, 8 vols. (Naples, 1757–92). 5 See Wendy A. Cooper, Classical Taste in America 1800–1840 (Baltimore Museum of Art, 1993), 56. 7 Betty C. Monkman, The White House, Its Historic Furnishings & First Families (White House Historical Association, 2000), 83–85. 8 Donald L. Fennimore and Robert Trump, “Joseph B. Barry, Philadelphia Cabinetmaker,” Antiques (May 1989): 1215.